Key books and reports on climate change and the media, 2012-2017 (Part 2). Media coverage of climate change has been, and remains, a significant factor in shaping public perceptions and attitudes toward the issue. The first book-length studies of this coverage appeared more than a decade ago, at a time when climate change was just beginning to gain prominence and when many major print and television news operations still had reporters assigned to science and/or environmental beats. In the years since, as both the climate and the news room have responded to changing conditions, the pace of such reports increased. 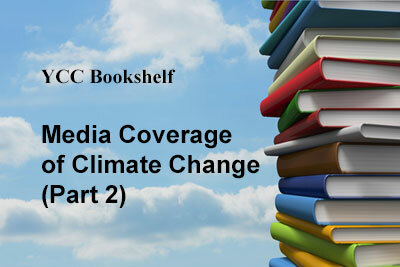 To provide perspective on the strange news world in which journalists and citizens now find themselves, Yale Climate Connections offers this overview of the key books and reports on media coverage of climate change – in two parts. Part 1 covered the years 2003 to 2011. This second part covers the years from 2012 to the present. The twelve books and reports featured below have been listed in chronological order. The descriptions of these books and reports have been drawn from copy provided by their publishers. Scientists and politicians are increasingly using the language of risk to describe the climate change challenge. Some researchers say stressing the “risks” from climate change rather than the “uncertainties” can create a more helpful context for policy makers and a stronger response from the public. But understanding the concepts of risk and uncertainty – and how to communicate them – is a hotly debated issue. In this book, James Painter analyses how the international media present these and other narratives around climate change. He focuses on coverage of reports by the Intergovernmental Panel on Climate Change (IPCC) and of the melting ice of the Arctic Sea, and includes six countries, Australia, France, India, Norway, the UK and the USA. This report looks at how television covers the environment, including key issues such as climate change and the weather, population, biodiversity loss, food and farming. Our aim is to discover what works and what doesn’t and whether broadcasters could be more effective in engaging mainstream audiences. The focus is non-news output. The news provides small nuggets of information but the rest of television helps place these in a wider context and make them comprehensible. Our findings are based on a quantitative study of all factual programming, drama and comedy on the main UK television channels over a 12-month period, and a series of interviews with TV commissioning editors, executives, independent producers, experts and NGOs. Based on an extensive review of the academic literature, this study examines the media’s reporting of risk and uncertainty around environmental and health stories, summarising how and when scientific stories involving them are reported, outlining theoretical approaches to media practices, and analysing the factors that lie behind the creation of news stories. A new study on the television coverage of the 2013/4 blockbuster reports by the Intergovernmental Panel on Climate Change (IPCC) shows similarities and differences in how Australia, Brazil, China, Germany, India and the UK cover climate change. In those countries that followed the IPCC reports, the reporting shared a strong emphasis on portraying the adverse impacts or “disaster” elements of the climate change story. Compared to the other three frames examined (uncertainty, opportunity, and explicit risk), disaster was the most present, the most salient and the most dominant. But there were important variations in how much attention the television channels paid to climate sceptics and the climate “pause” (the lack of a significant rise in global average temperatures since 1998). “Disaster Averted?” is unusual as it is one of the few to focus on television (which is still the most trusted and used source of news in most countries), on the IPCC reports, and on a combination of developed and developing countries. CNN, Fox News, and MSNBC are the most widely watched cable news networks in the U.S. Their coverage of climate change is an influential source of information for the public and policy makers alike. To gauge how accurately these networks inform their audiences about climate change, UCS analyzed the networks’ climate science coverage in 2013 and found that each network treated climate science very differently. Fox News was the least accurate; 72 percent of its 2013 climate science-related segments contained misleading statements. CNN was in the middle, with about a third of segments featuring misleading statements. MSNBC was the most accurate, with only eight percent of segments containing misleading statements. The public deserves climate coverage that gets the science right. Media outlets can do more to foster a fact-based conversation about climate change and policies designed to address it, rather than contributing to a broken and inaccurate debate about the established facts of climate science. The news media has become a key arena for staging environmental conflicts. Through a range of illuminating examples ranging from climate change to oil spills, Media, Environment and the Network Society provides a timely and far-reaching analysis of the media politics of contemporary environmental debates. Alison G. Anderson is Professor of Sociology and Director of the Centre for Culture, Community and Society at the University of Plymouth, UK, a former editor of Environmental Communication, and the author, previously, of Media, Culture and the Environment (1997). New “digital-born players” such as Huffington Post, BuzzFeed and Vice are challenging traditional media in their provision of news in general, and about the environment in particular. They have invested heavily in a wide range of countries and languages in an attempt to reach young audiences, who increasingly use social media as their source of news. Despite their success, these new players have hardly been studied. This book, written by lead author James Painter and researchers in five countries, takes the UN summit on climate change in December 2015 as a case study, and analyses how new players and legacy media in France, Germany, Spain, the UK, and the USA covered it. It shows that new players are an important addition to climate change coverage. They reach new segments of the audience with a wide range of novel reporting styles, formats, and tone that marks them out from more established media. The authors argue that this is particularly beneficial at a time when environmental reporting is being reduced in media organisations across the world. Journalism and Climate Crisis: Public Engagement, Media Alternatives recognizes that climate change is more than an environmental crisis. It is also a question of political and communicative capacity. This book enquires into which approaches to journalism can best enable humanity to productively address climate crisis. The book combines selective overviews of previous research, normative enquiry (what should journalism be doing?) and original empirical case studies of environmental communication and media coverage in Australia and Canada. The authors argue for forms of journalism that can encourage public engagement and mobilization to challenge the powerful interests vested in a high-carbon economy. Ultimately, the book argues for a fundamental rethinking of relationships between journalism, publics, democracy and climate crisis. Research on media coverage of climate change, as a particular subfield of environmental communication research, has proliferated over the past decade. This book considers what conclusions can be drawn in light of that work, what lessons can be learned, what the challenges must be met, and what directions should be taken to further develop research. The articles in this volume illustrate the range of empirical, theoretical, and methodological approaches subsumed under the broad heading of “media studies on climate change.” The authors suggest important avenues of research, be they centered on media, context, applicability of results, or theoretical advancement. As such they make a valuable contribution to identifying important directions for future research on the role of the media in communicating climate change. This book was previously published as a special issue of Environmental Communication. Today’s global media sustains a potent new environmental consciousness. Paradoxically, it also serves as a far-reaching platform that promotes the unsustainable consumption ravaging our planet. [To understand how] the media draws the cultural boundaries of our environmental imagination – and influences just who benefits – Patrick Murphy musters theory, fieldwork, and empirical research to map how the media communicates today’s many distinct, competing, and even antagonistic environmental discourses. He identifies and examines key terms, phrases, and metaphors as well as the ways consumers are presented with ideas like agency and the place of nature. As the author shows, today’s complex, integrated media networks shape, frame, and deliver many of our underlying ideas about the environment. Increasingly – and ominously – individuals and communities experience these ideas not only in the developed world but in the increasingly consumption-oriented Global South.